We're on the home straight of the tour now and the mood in the camp is still high. Of course it is. Touring is fun. And the venues have all been sold out. There are still a few tickets left for tomorrow night on the Isle of Wight, mind and for a few of the others coming up. (Bristol, Belfast, Dartford, Dorking, Cambridge, Sheffield, Liverpool and then, finally, four nights in London). 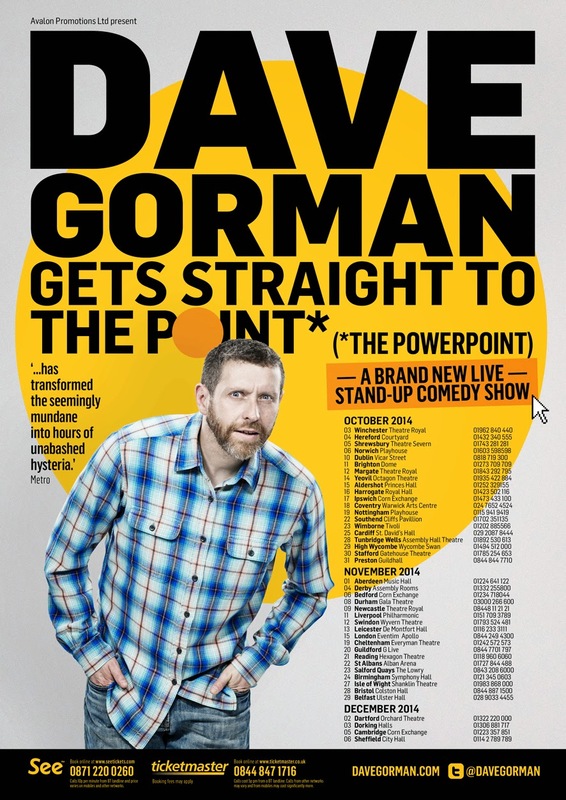 I keep having chats with people on Twitter who tell me that they think the shows are sold out - because that's what the internet tells them - but who then manage to get a ticket by calling the venue. There are almost always late releases of tickets that were held for press etc and so most of the time, a handful of people get last minute tickets that never make it back on to the websites. But because the show has been selling out there are plenty of venues asking us to do extra shows and a fair few new venues wanting the show to come to them as well... and so instead of being on the home straight, we're actually approaching the halfway point. We're extending the tour into 2015. The tickets went on sale, exclusively through See Tickets this morning. They'll be on general sale from Friday. 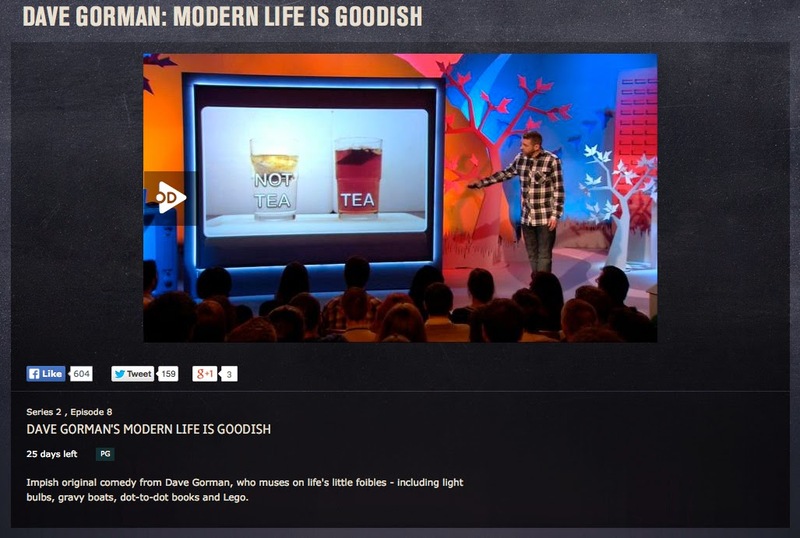 We've had a couple of days off on the tour... and as Tuesday night came I became aware that quite a few people were sending me messages asking why there wasn't an episode of Modern Life Is Goodish on the box? Has it ended? Has it been moved? It's very pleasing to know that it had become a Tuesday night habit for folks. If you were one of them: thanks. It really does mean a lot. But yes, the series has run its eight-week course. Everyone involved has been thrilled by the show's reception. I've tried to respond with gratitude to as much of the feedback as I can. The nice people at Dave have put all of the shows - the six episodes from series one and the eight episodes from series two online for a while. If you missed an episode, joined the series late, had no idea that this wasn't the first series and would like to see the stuff you missed - or if you just want to prove to yourself that we did move the string quartet to a different location, change the look of the trees for series two and tweak the opening titles so that there were now four different endings... then you can do so here. I've had a lot of tweets asking about series three. It has been commissioned and we'll start work on it in the new year. 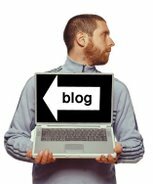 One of the most frequent questions I'm asked is how to get tickets to be in the audience. The answer is that, like all TV recordings, the tickets are free. But my mailing list gets first dibs. You can subscribe - and, for that matter, you can unsubscribe - right here. In the mean time, it's also easy enough to get tickets for the tour show. We're half way through the tour now and it's going great guns. Details for all the remaining dates are on the Live Dates page. A lot of the dates (but not all) show up as sold out online but, as I explained recently, it's always worth a phone call.